The French Spaniel is a descendant of the bird dogs used in the Middle Ages. 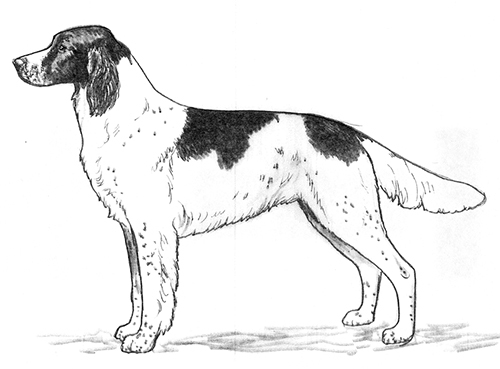 The diverse varieties of hunting spaniels are descended from this breed. Through careful selection, the French Spaniel developed into an elegant and athletic pointing breed. 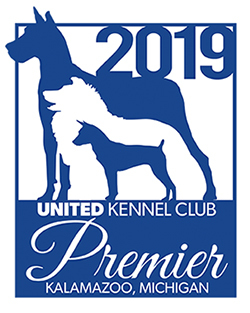 The Epagneul Francais was recognized by the United Kennel Club January 1, 1996. Medium sized, well balanced, elegant and well muscled, with strong but not coarse bone. Soft, calm and docile, the French Spaniel is an enthusiastic hunter, sociable with other animals and an ideal companion. He is an excellent pointing and retrieving dog. The head is of medium length and width, not heavy, and is carried proudly. The skull is the same width from the ear to the eye. The superciliary arches are marked. In profile, the planes of the skull and the muzzle are slightly divergent. A little shorter than the skull. A slightly convex nasal bridge is preferred to a straight one. The upper lip falls vertically from the nose, and covers the lower jaw but is not pendulant. The Epagneul Francais has a complete set of evenly spaced, white teeth meeting in a scissors or level bite. Well pigmented, with wide open nostrils. Quite large and oval in shape, dark amber in color, expressing softness and intelligence. The eyerims fit tightly. The ears are set well back on the head at eye level. Pulled forward, the tip reaches just to the nose. The ears are well covered with wavy, silky hair down to the rounded tips. Oval in shape, slightly arched, and without dewlap. The shoulder blade is well attached and laid back at an angle of about 50 degrees. The upper arm is angled at about 60 degrees. The legs are straight, lean and muscular, and furnished with wavy, silky hair. The pastern joint is well defined and lean, and the pastern is slightly sloping. The body is longer than tall, fitting into a rectangle. The chest is deep and round, with a well developed forechest. The withers are quite high, lean and broad, and there is a slight downward slope from the withers to the topline, which is straight and firm in action. The loin is broad and powerful, and the croup is rounded and without any bony outline. The underline is slightly tucked up towards the belly. Seen from behind, the hindquarters are vertical, with powerful, well muscled limbs. The thighs are long, broad and well angulated. The hock joint is solid and strong. Oval, with tight, well arched toes and firm pads. The tail is set below the topline, falls obliquely, and is curved like a saber. It is strong at the root, tapers toward the tip and reaches to the hock joint. It is furnished with long, wavy, silky fringes that get longer to the center part and then taper in length to the tip. The coat is long and wavy on the ears, legs and tail. It is flat and silky on the body and short and fine on the head. Faults: Curly hair on the body. Lack of furnishings. White and brown in irregular patches, with or without ticking and roaning. The brown varies from cinnamon to dark liver. A white blaze on the head is appreciated but its absence is not a fault. The pigment of all outer mucous membranes is brown. Fault: White surrounding the eyes. Disqualification: Any color other than white and brown. Height at the withers for males is 22 to 24 inches. For females, it is 21.5 to 23 inches. There is a tolerance of up to one inch over the recommended size. Easy, supple, energetic and elegant, with no exaggerated lift of the legs, and no rolling of the body. Size outside the limits of the standard. Any color other than white and brown.